NEW ORLEANS – If a team was in the top-12 of last week’s NCAA Division III Women’s Cross Country National Coaches’ Poll, then it can breathe safely – at least for another week. 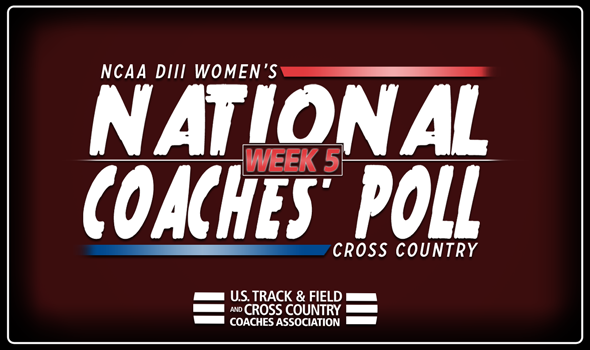 The most recent poll, released Wednesday by the U.S. Track & Field and Cross Country Coaches Association (USTFCCCA), saw no changes to the top-12 from Week 4 to Week 5, but a plethora of them from No. 13 to No. 35. In fact, 18 of the 23 teams that were ranked between No. 13 and No. 35 last week shifted spots. Pomona-Pitzer continues to climb in the National Coaches’ Poll. After not being ranked in the preseason, the Sagehens worked their way up to No. 15 in Week 3 and now No. 14 in Week 5. It was a strong effort at its own Pomona-Pitzer Invitational that propelled the squad up four spots from Week 4. The Sagehens, led by Helen Guo’s individual title, won the meet with 48 points as they put four runners in the top-15. St. Thomas (Minn.) was the only other program to move more than one spot in the positive direction. The Tommies continue to ride the wave of momentum from their performance at the Roy Griak Invitational. St. Thomas (Minn.) finished second out of every NCAA DIII program entered in the Women’s Maroon Race two weeks ago. Dickinson posted one of the most lopsided wins of the past weekend when it romped to the team title at the DeSales Invitational by 64 points. The Red Devils moved up one spot from No. 15 to No. 14, which ties their highest billing of the season. Here are the other teams that moved up one spot from Week 4: Brandeis from No. 19 to No. 18, Otterbein from No. 22 to No. 21, North Central (Ill.) from No. 24 to No. 23, Emory from No. 29 to No. 28 and Carnegie Mellon from No. 31 to No. 30.